This painting rises almost a quarter of an inch off the panel, made thick with hand ground gypsum rock mixed right into the gesso. A laborious process, it leaves a grit of varied partical sizes that makes the rock seem more natural. 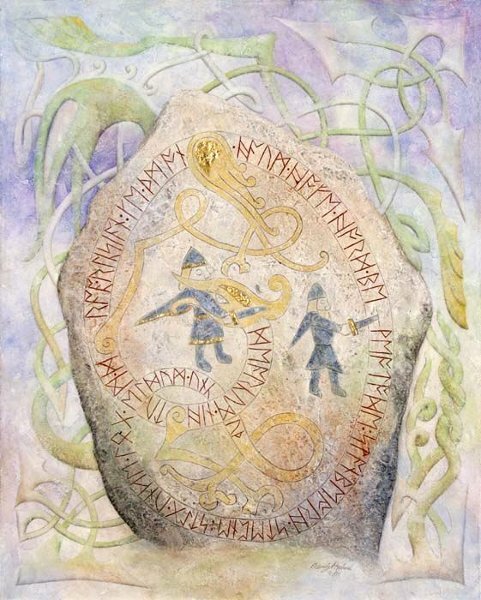 The stone is actually carved in authentic design and Anglo-Saxon runes. The language is Old English, which is the appropriate language to be written in these letters. The text is a quote from the Anglo-Saxon story of Beowulf and describes the coming of the dragon to the kingdom of the Geats. "Deorcum nihtum draca ricsan se the on heaum hofe hord beweotode, stan-beorh steapne; stig under leog eldum uncuth." Translated it says: "A dragon began to rule in the dark nights, the guard of a hoard in a high barrow hall. Towering stone mound, the entrance beneath it lay unknown to men."